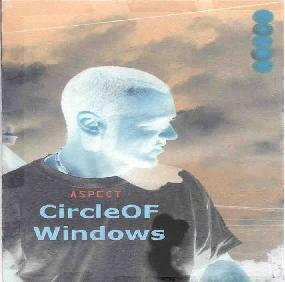 Aspect - "Circle Of Windows"
Aspect are a improvisational duo from Salem, Ohio that create meandering experimental rock music with samples and repetitive rhythms and loops. One of the CDs sounds like a jam in the rehearsal room while the other CD, I assume, is the real intended CD. Anyway, there were 2 cds in the package and only artwork for one. Each CD contains 7 tracks. The CD artwork only mentions 7 tracks total and nothing about a second CD. The rehearsal room CD I found to be very boring and did not really seem to go anywhere. The CD which is multitracked that I think is the real one has some pretty cool stuff on it. Bass, drums and meandering guitar with samples is a reasonable overall description. It is pretty repetitive at times. Occasionally they find a groove that is pretty interesting. This is not an easy one to describe. They have an excellent web page where you can download their music and make your own custom mixes, etc. They are very prolific at the moment creating loads of new stuff. For more information you can visit the Mudball Records web site at: http://slack.vze.com. Contact via snail mail c/o Aspect; PO Box 1054; Salem, OH 44460.